The Airco DH.9C was a British passenger aircraft. After WW1 there were many surplus Airco DH.9 light bombers, designed by Geoffrey de Havilland, available for the emerging air transport business. 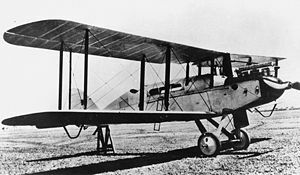 At first stripped DH.9s were used to carry one passenger behind the pilot in the gunner's position, but later versions, designated DH.9B added a second passenger seat ahead of the pilot. A second seat behind the pilot was added by extending the rear cockpit in the early DH.9C. Later DH.9Cs had this rear position converted to hold two passengers face to face, protected by a faired dorsal canopy or cabin. Most of these later four seat aircraft had slight sweepback to counter the rearward shift in the centre of gravity. The DH.9, DH.9B and DH.9C were dimensionally similar, with the same span and height and only small variations in length depending on the powerplant. They were two bay tractor biplanes, with fixed two wheel main and tail-skid undercarriage. Their structures were of spruce and ash, wire braced and fabric covered. The first four seat, swept DH.9C, G-EAYT received its C of A on 13 January 1922. Nineteen aircraft were produced for operators, 13 in the UK, 3 in Australia, and 3 in Spain. The last in service was operated by Northern Air Lines in Barton, Greater Manchester until 1932. Airco DH.9C Pictures and Airco DH.9C for Sale.